After completing Los Angeles (read part 1 of this 7 blog series here), I planned and ran a second marathon in October 2007 (Marine Corps Marathon). Shedding 25 minutes off my LA debut time of 4:01, I felt a lot more comfortable about qualifying for the Boston Marathon. Prior to this year, I needed to run a 3:20 marathon based on my 40 year age. (Now, I would need 3:15 and even that would not guarantee entry. See this link for more about Boston's qualifying time changes.) I do not think I really knew how audacious it would be to qualify for Boston so early in my marathon career. And then I stumbled on a book. The title was deceptively simple and at the same time expansively descriptive: Running the Seven Continents by Clint Morrison. Here's a link. I think I saw the book advertised in the back of Runners World magazine. My Amazon account reveals that I ordered my copy on December 30, 2007. Rebecca and I had already booked a vacation to Japan before I had the book, I knew I wanted to combine my new found love of running with my old one of traveling. And I figured it would be cool to do so in Japan, a place we visited in 2005 and loved. But once I read Morrison's account of his own 7 continent trek (over almost 20 years), the holiday to Japan took on new meaning and new purpose. Not only would I qualify for Boston, but I would hit my second continent. Morrison sort of stumbled into the quest having run a few continents before formalizing a plan. He also started in the 1980's when he was an English teacher in Japan - well before an Antarctica marathon was even contemplated. Morrison keenly kept notes on his races, and his observations come across in the book as clear recollections about his feelings, his running performance and the people and places he saw. I read the book in just a few days. I booked the trip to Antarctica within the week. But that would take place years in the future. The Japan trip had been planned as three 3-day stops. First up was Kyoto in a traditional Ryokan, then up to Nagano for the marathon and finally closing in Tokyo near the Ginza shopping area. The Marathon was on the 6th day and exactly 1 year and 1 day prior to the Boston Marathon. But why Nagano? 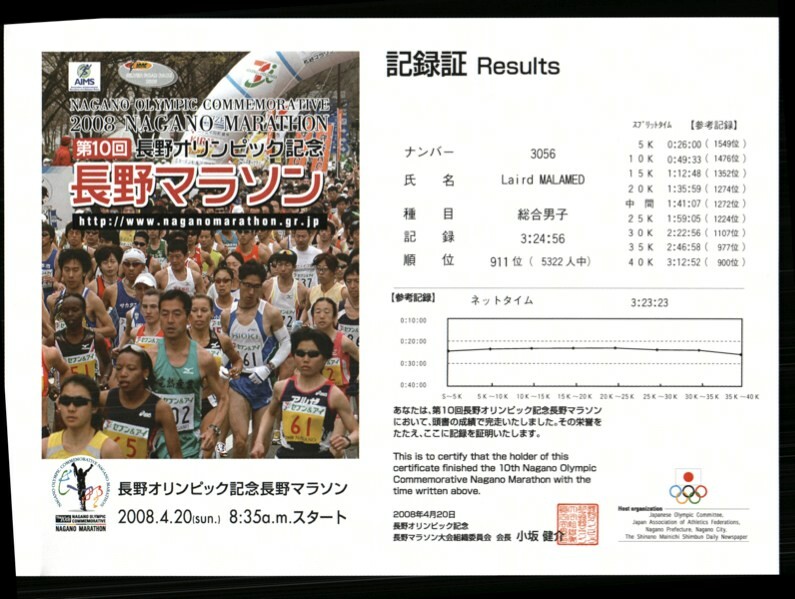 In searching for a race, I found that Nagano had a marathon to commemorate the 1998 Olympics. So, this was the 10th anniversary which made it special. But wait a moment, the 1988 Olympics were the Winter Games. Why in the world did Nagano have a marathon (a summer event) to celebrate their games? I never did get an answer, but the course ranged all over Nagano passing various Olympic venues as well as areas of the old city. The course was relatively flat, and it started at the baseball venue and finished inside the Olympic Stadium (home of the opening and closing ceremonies). Those were good enough reasons to try it. Plus, Nagano is in the Japanese Alps, and we had just been to Southern Alps in New Zealand to add to our numerous trips to the Swiss Alps. Why not complete the set? 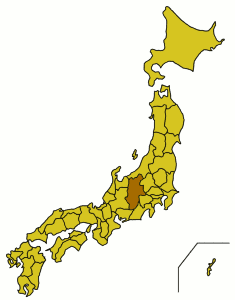 When we visited Japan the first time, my co-worker John had suggested we get outside of Tokyo and visit Hokone near Mt. Fuji. There we stayed in a Japanese Inn which we loved. That had me looking for something like that in Nagano. I found nothing online I really liked, but outside of Nagano in Hakuba at the base of the Olympic ski jump venue, I found a small hotel called Happo Lodge. Sort of half inn, half tourist bed and breakfast. Not exactly what I had been searching for, but they seemed to speak English and the inn advertise a nearby onsen (Japanese bath). Somewhere a few before we left the United States, I emailed the hotel to find out about how to get from their inn to the marathon on the day of the race. Would the trains run that early? Could I arrange a car, or did I need to rent one? I received back a nice note from "Monica" - a curiously un-Japanese sounding name. She said in fact her husband and the hotel's manager was also running the race! He and two friends from Tokyo were all driving in together, and I was invited to join them. The only catch was they might run slower than me and I would have to wait for them to finish. Of course, I heartily accepted. The Monica mystery dissolved upon our arrival. A very European mid-thirties woman greeted us. She and her husband had met in Prague when he was studying aboard. They fell in love and she followed him back to Japan to help run the family inn where we stayed. They had been married a few years and had a young daughter. The restaurant at the hotel in fact served a mixture of traditional Japanese food and central-European cuisine with a bit of French thrown in for good measure. (Monica spoke French fluently to go with her English, Czech and still developing Japanese. She quizzed Rebecca on parenting tips.) Needless to say, everyone was very friendly. 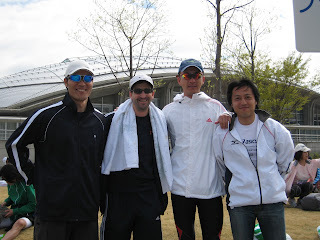 The day of the race dawned, and I met the other two marathoners. We drove the hour into town and parked in one of the designated lots. A bus shuttled us to the start. We were about 90 minutes early, so we parted ways to go through our own warm ups and enter our started corrals (based on expected finishing time). 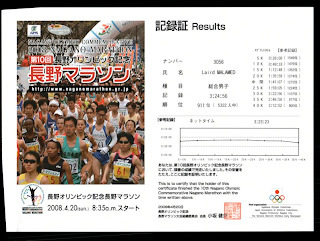 Nagano has a cut off of 5 hours which is pretty fast for a marathon; only about 500 ran the race. I had a good day, but a strong headwind in the final 5 miles slowed me to 3:25. I wasn't overly disappointed because I had snuck in another marathon two months earlier in Arizona and already qualified for Boston with a PR of 3:19. 3:25 remains my second fastest marathon by 5 minutes. The course was lovely and mostly on bike paths and through parks. Everyone was super friendly, and I felt comfortable the entire time. Instead of a commemorative finisher's medal, runners are draped in large beach towels. While more functional, I found the lack of medals off given the clearly possible Olympic tie-ins there. Oh well. I have a drawer of those things anyway, but only one marathon towel. Arthur Dent and Ford Prefect would commend such a giveaway in any regard. What about my co-runners? Well, I was the first to finish. The 2nd came in just behind me, and we met up quickly. And then the third come around 4:15. But where was our host and hotel manager? His cell phone went straight to voicemail. Sadly, he showed up in a van after another hour; he had been fighting an injury and had only made it to mile 16 before he was required to give up for the day. His cell phone battery had died. Still he seemed happy to have run that far. Post race. Note my attractive towel. We dropped his two friends at the train station to head back to Tokyo, and we grabbed food at a local supermarket before driving back to well needed showers and rest. Two continents down and five to go. Hmmm. What could I plan that would top this trip? Click here to find out.